If you want to see the richest city in the world then you have to travel to the Famagusta city, which is the capital of the Famagusta district. It is located in the east of Mediterranean island. It has the deepest harbor among all other harbors present in this island. Your trip will not be a good one unless you have very good boarding places. Bilfer Palm Beach Hotel is located on the shore of a beach and this allows the hotel to give you a very good sight of the Mediterranean Sea. Each room is built in such that way. It gets breeze from the sea and the sight of sea from the balconies worth a million. As Bilfer Palm Beach Hotel is a 5 star hotel you can get all the luxuries like air conditioned rooms, television, facilities, bars etc. When compared to boarding charges of the other hotels, Palm Beach's charges are less. You should not miss the open-air disco and international casino in the evening and definitely it will be an awesome experience for you. 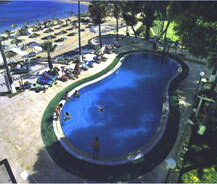 North Cyprus is the perfect holiday destination and Bilfer Palm Beach Hotel adds value to your stay at there.